In a microwave-safe bowl, melt the bittersweet and mint chocolates in 30-second intervals until nearly melted. Whisk until smooth, then let cool. In a medium bowl, whisk the flour with the cocoa and salt. In the bowl of a standing electric mixer fitted with the paddle, beat the butter until creamy. Add the granulated sugar and brown sugar and beat at medium-high speed until light and fluffy, about 3 minutes. Beat in the egg yolks and vanilla. Scrape the chocolate into the mixer and beat just until incorporated. Add the dry ingredients and beat at low speed, scraping the side of the bowl occasionally, until smooth. Transfer the dough to a sheet of plastic wrap and pat it into a 7-inch disk; wrap it up and refrigerate until chilled and firm, at least 1 hour. Preheat the oven to 350° and position racks in the upper and lower thirds. Line 2 cookie sheets with parchment paper. Spread the coarse sugar in a shallow bowl. Scoop up tablespoons of the dough and roll them into balls, then roll in the coarse sugar; transfer to the baking sheets. 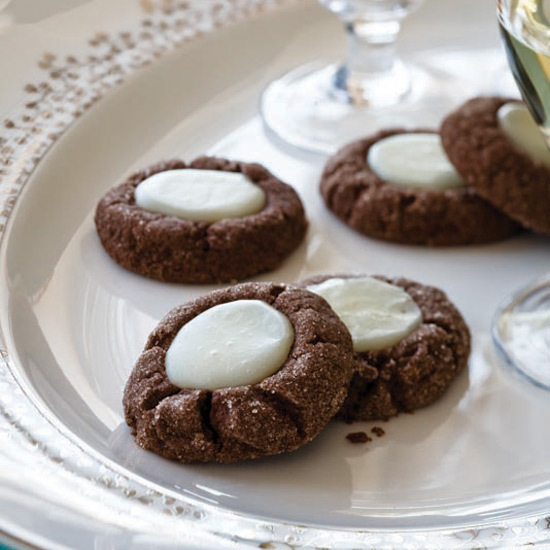 Using your thumb or a melon baller, make an indentation in the center of each cookie. Bake the cookies for 10 minutes, until slightly firm. Remove the cookie sheets from the oven. Using the melon baller, press into the cookies again. Return the cookies to the oven, shifting the cookie sheets, and bake for 5 minutes longer, just until dry but not hard. Transfer the cookie sheets to racks to cool completely. Put the white chocolate in a heatproof cup. Put the cream into a microwave-safe bowl and microwave at high power until boiling, about 30 seconds. Pour the hot cream over the white chocolate and let stand until melted, then whisk until smooth. Stir in the peppermint extract. Fill the thumbprints with the white-chocolate ganache and refrigerate just until set, about 30 minutes.